The Barn Owl is a stunningly beautiful bird with golden/buff coloured upper parts laced with silver grey and white under-parts. It has a distinctive white, heart-shaped face and when caught in flight in car headlights, the overall impression is of a large white bird. The flight is buoyant and wonderfully graceful. The wings, spanning 85cm, are much bigger than the body. Although hunting from perches such as fence posts is frequent, especially in winter, hunting whilst flying is their main method. Typically, the owl will leave its roost site shortly after dusk and fly directly to one of its preferred hunting areas. Hunting usually consists of flying slowly back and forth across a patch of rough grass, listening and looking downwards most of the time. When a small mammal is heard the owl hovers overhead concentrating intently on the source of the sound, pinpointing it and waiting for the best possible moment to pounce. The importance of hearing means that the bird is rarely more than three metres above the ground and, whilst hovering over prey, the owl may pause at about two metres before finally dropping into the grass. The final dive is usually face-first and at the last moment the head is thrown back and replaced by the feet with talons fully out-stretched. Barn Owls have some amazing adaptations enabling them to find and catch small mammals hidden in deep vegetation in the dark. The Barn Owl's heart-shaped face works in a similar way to our outer ears - collecting and directing sounds toward the inner ears. The ear openings are situated inside the facial disc just behind the eyes. They are shaped differently and placed asymmetrically, one higher than the other. As a result, sounds reaching the two ears are heard very differently. By analysing these differences the owl's brain automatically calculates the exact position of the sound-source. Experiments with captive owls have confirmed that they are able to locate and capture prey in total darkness - using their hearing alone. Barn Owl eyes are about twice as light sensitive as human eyes. In addition, the owl's low-light vision is highly movement sensitive. In near-darkness, humans may see areas of dim light and shadow but little detail. In the same conditions, a Barn Owl has a brighter image and can see detail within the shadows. Anything small that starts to move is instantly noticed by the owl but is unseen by most humans. 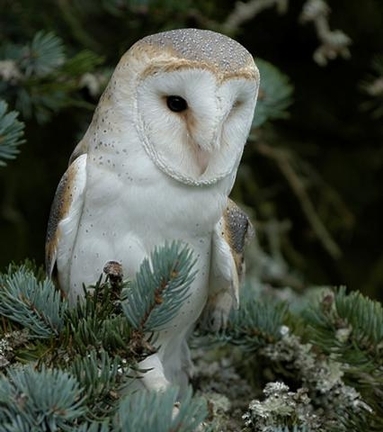 These faculties together with soft feathers for silent flight and long legs for reaching into long grass make the Barn Owl a very effective hunter. The Barn Owl is a cosmopolitan bird being widely distributed in Europe, Africa, southern Asia, Australasia, USA, Central and South America. Most of its range is essentially tropical. Their breeding season, which can span the entire year, reflects this tropical heritage. Even here in Scotland, active nest sites have been found in all months of the year. Depending on the availability of food, some birds attempt two and occasionally three broods. The Scottish population is one of the most northerly breeding populations. Its range in Scotland is limited by a susceptibility to hard winters particularly to extended periods of snow cover which hides prey items. As a result, in Scotland its distribution is biased towards the milder parts of the south and west with smaller numbers in the north and east. 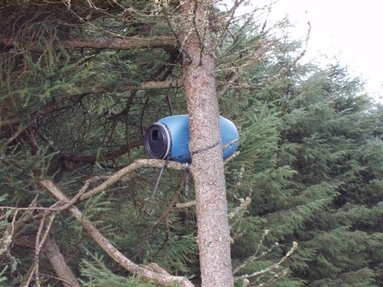 Here on Arran, Barn Owls have been able to exploit increased field vole populations in planted conifer forests by the use of tree mounted nest boxes. Started in 1988, Barn Owl nest boxes have been put up and monitored on Arran by Rab Logan, Wildlife Ranger of the Forestry Commission (Scotland). The annual breeding success is to a large extent dependent on the vole population. Vole populations in northern Europe show regular cycles of abundance typically building to a peak every three or four years followed by a crash and a build up to the next peak. In 2010, although the vole population was not at peak levels, there were eighteen active nest boxes throughout the forest and a total of seventy three eggs were laid. Only one of the nest sites did not produce any fledglings. Overall the conversion from eggs to fledglings in 2010 was around forty percent. In 2011, from the twenty eight nest boxes checked throughout the forest, there were a total of fifty three chicks. Young in the nest have been ringed by Terry Southall and in recent years Barn Owls ringed on Arran have turned up in Skye, the Black Isle and Campbeltown. This reflects the ongoing success of this project in helping to maintain a high density of this very special Schedule 1 Species on Arran.